Today in the food section, I wrote an essay about cool-weather cooking. I mention roasting a chicken. I like to dry brine my chicken before roasting. 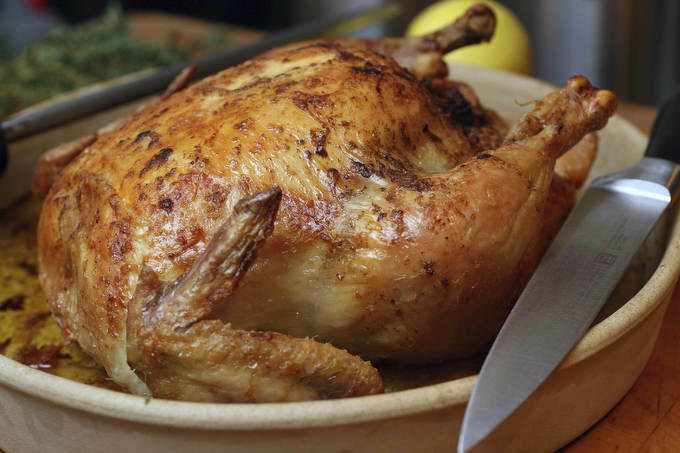 Here’s a recipe for dry brined chicken. Adapted from chef Judy Rodgers of Zuni Cafe in San Francisco via Russ Parsons and the Los Angeles Times. Into a bowl, measure 1 teaspoon of salt for every pound the chicken weighs. Using that salt, liberally season the chicken inside and out. Use a little more salt on the thick parts, such as the breast and thighs. Place the chicken in a loose plastic bag, such as one you’d use for produce in the grocery store. Loosely twist the top, place the chicken on a plate or platter, and refrigerate for at least one day. Every once in a while, massage the salt into the skin. Remove the chicken from the bag. There should be no salt visible on the surface and the skin should be moist but not wet. Wipe the chicken dry with a paper towel, place it breast-side up on a plate, and leave it at room temperature at least 1 hour. Preheat the oven to 425 degrees. Cut the lemons in half and drizzle some juice over the breast and thighs. Place the lemons inside the chicken cavity. Tuck sprigs of rosemary under the wings and thighs. Place the chicken breast-side down on a roasting rack in a roasting pan; put it in the oven. After 30 minutes, remove the pan from the oven and carefully turn the chicken over so the breast is facing up. It’s easiest to do this by hand, using kitchen towels or oven mitts. Reduce the oven temperature to 350 degrees, return the chicken to the oven and roast until a thermometer inserted in the deepest part of the thigh, but not touching the bone, reads 165 degrees, about 1 to 1-1/4 hours total roasting. Remove the chicken from the oven, transfer it to a warm platter or carving board; tent loosely with foil. Let stand at least 10 minutes to let the juices redistribute through the meat. Carve and serve.